Success lies not in knowledge, but in the effective application of knowledge. Pilots learn to fly one skill at a time. It begins with a discussion of each skill such that there is a thorough understanding of the skill and the expected outcome associated with it. Next, the skill is practiced either in an aircraft or an aircraft-specific simulator under the watchful eye of an instructor. Once a level of competency is achieved in a particular skill, only then is the next skill introduced. Hence, flying competency is achieved in a sequential, stepwise fashion that reinforces practical application while maximizing retention. Just as a pilot cannot learn to fly by merely learning the didactic elements of aerodynamics and aircraft operations, a medical sales professional cannot succeed on knowledge alone. Sales Pilot designed the Sales Simulator™ to practice and learn the essential medical selling skills and your specific sales message in a controlled, but realistic environment. 2. Ongoing, solo practice using a unique, university-tested and medical-sales proven practice tool that ensures your sales message and brand message is intact, compliant, and on-target 90-100% of the time. The representative practices regularly until achieving validation, and then only a minimum amount of practice is required to maintain the skills. Salespeople practice at their own convenience, wherever they are! 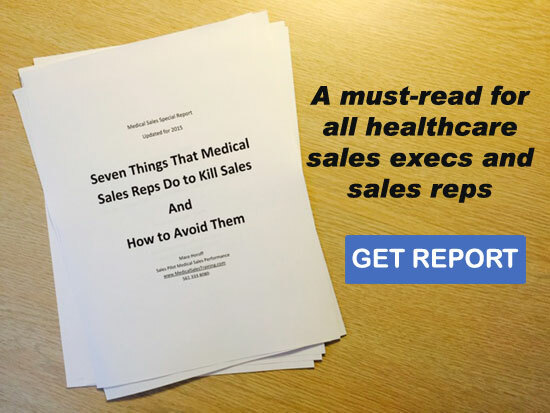 A common concern from VP’s of Sales and managers who ride-along on sales calls is that sales representatives often stumble for words, or don’t articulate a complete sales or brand message. A study performed at Clemson University showed that only 10-20% of a defined sales or brand message was articulated correctly by Fortune 500 sales representatives. The remainder of the message is either something that they heard or something that they made up. Following validation, the computer-based practice system, the same reps were able to articulate 90% of the sales intact message after only one hour of practice! Another common problem is the high-pressure that medical sales representatives are under when they are fielding objections from tough clinical experts. It often causes the sales rep to lose his or her confidence and then lose the sale. The Sales Simulator™ changes all that by allowing the sales representative to respond automatically and correctly, just as a pilot responds to changing conditions automatically. Learning takes place in the Sales Simulator™ because the student is fully engaged—he or she has no choice. There is a level of pressure that forces them to think and respond, and then to evaluate their actions. Learning is also enhanced because the activities during the sales simulations bring the challenges in the real world out into the open. The opportunity to address these challenges in a group under the experienced tutelage of the facilitator and then to practice them independently is invaluable. Pilots don’t fly unless they are competent—there is just too much on the line. Think about what’s on the line each time one of your sales representatives engages a customer. Competency must be mandatory! To learn how the Sales Simulator™ can move your sales force from knowing to selling, please call Sales Pilot at 561.333.8080 or email us .